The broad definition of ecology is the study of organisms in relation to their surroundings. 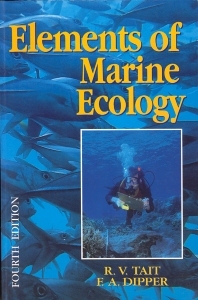 This book presents marine ecology as a coherent science, providing undergraduate students with an essential foundation of knowledge in the structure and functioning of marine ecosystems. The fourth edition has been thoroughly revised and updated to meet the needs of today's courses. A new chapter Human impact on the marine environment focuses on issues such as marine pollution, global warming, ocean management, marine nature reserves, and the effects of fisheries and aquaculture. New material has also been added on deep-sea hydrothermal vents and coral reefs, features such as El Nino, and ocean processes including the microbial loop, dissolved organic matter (DOM), and dimethyl sulphide (DMS).